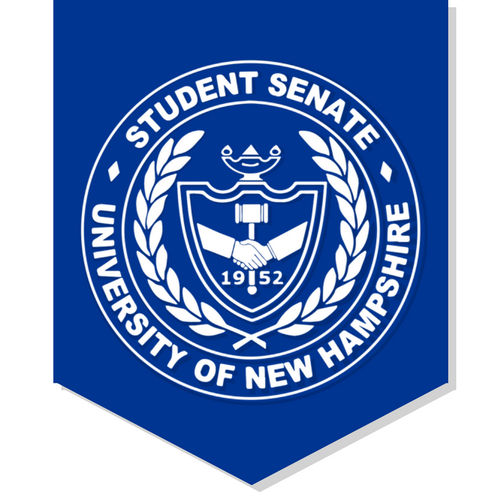 The Student Senate is the official voice of the undergraduate Student Body at the University of New Hampshire. The Student Senate and the various offices and officials underneath it work to advocate for student concerns, and to sway the Administration to act in the best interests of the Student Body. The Student Senate, autonomous of the Administration, also controls the annually collected Student Activity Fee, a mandatory fee that all undergraduate students pay to fund student activities and events. The Student Senate also must approve changes to the Student Rights, Rules, and Responsibilities, and reviews other sections of the SRRR and the Student Code of Conduct. Meetings of the Student Senate are open to the public. For the fall semester 2018, the Student Senate meets on Sunday evenings at 6:00 pm in Hamilton Smith Hall Room 205, unless otherwise posted. The first form of student government at the University of New Hampshire, then still called the New Hampshire College of Agriculture and the Mechanic Art, was the Student Council, formed in 1907. The Student Council was largely responsible for supervising relations between the separate class governments and for contests and activities between them. The Student Council was also noted for attempting to control hazing. In 1912, the Student Council was reorganized to include the College President, one member of the faculty, five junior or senior fraternity brothers and two junior or senior non-members of fraternities. The first female student government was the Women’s Council, which was established in 1911. The Women’s Council was responsible for creating and enforcing rules of conduct in female-only (named co-ed despite being exclusively women) dormitories. By the year 1950, the male Student Council had expanded to include more members and was exclusively student-run with no faculty participation. The Women’s Council had been dissolved and had become the Association of Women Students (AWS). During the 1950s, a movement spread throughout the Student Body that called for a unified student government that could speak on behalf of all students, regardless of gender. By 1952, the student body had voted to approve a referendum that created a constitution for a united student government, called the Student Senate. In the mid-1960s, there grew an increasing desire for greater student say in university affairs. The University Senate, a body composed of faculty and administrators that had a wide range of powers that is unseen in the modern University political structure, included no student voting members, a structure that was disapproved of by many students and faculty alike. A protest was called in the fall of 1968, attended by over 1,000 students, that called on the Administration to solidify students’ role in University governance, and to completely remove Student Senate’s need to gain the University’s approval for its decisions. A committee was appointed by the administration in June, 1968 to address these demands and to review both student and faculty government within the University. The results of the committee’s findings led to the establishment of a new University Senate, which was comprised of 30 faculty, 30 students, 12 administrators, and 5 graduate student voting members. This University Senate had full powers over student and faculty governance, as well as educational policy previously belonging to the purview of the administration. The formation of the University Senate forced the first Student Senate to dissolve by the end of May, 1969, when the new University Senate would take power. "At 9:03 p.m. Monday, May 5 1969, the UNH Student Senate, having served the University for 17 years, was dissolved." -The New Hampshire, March 6th, 1969. The student portion of this new University Senate was called the Student Caucus, which met separately from Faculty Caucus and the rest of the Senate to give a solely student perspective on issues before the body. This system of student involvement greatly frustrated many – faculty were dissatisfied to have equal voting rights as the students they taught in their own classrooms, and students were dissatisfied that administrators and faculty members had control over student self-government and activities. Eventually, by 1977 many issues had surfaced that hindered the functioning and operation of the joint student-faculty senate. In spring of 1977, the University Senate, at an impasse on many of the issues affecting the University, was dissolved by the then University President Eugene Mills. The Academic Senate, the historical predecessor to the modern Faculty Senate, was formed shortly thereafter, and was given jurisdiction over educational policies and other academic affairs. The Academic Senate was an expanded version of the Faculty Caucus, and contained little or no voting student representation. A task force of students was appointed to recommend a new governance system for students with jurisdiction over policies and matters pertaining to student life. The Constitution for a new Student Senate, based on a similar power and organizational structure as its 1969 predecessor, was completed and signed by President Mills in May of 1979. This Student Senate, which is the iteration still in existence today, is the longest surviving student government ever to exist at the University of New Hampshire, proving that the decades of hardship in the mid 20th-century for students’ right to self-government had finally succeeded. Many grievances put forth in the protests of the 1960s, such as complete student control over the funding of student organizations, is now realized through the Student Activity Fee Committee of this, the current, Student Senate. Student demands for a say in the student conduct system are realized in the Student Senate’s enduring power to review changes to the Student Rights, Rules, and Responsibilities. Finally, and perhaps most importantly, the push for the autonomy of student government is fulfilled by the complete student composition of the Student Senate, which does not even have a faculty or administrator advisor. While the Student Senate, like all other forms of government, is by no means perfect, its resilience to address the needs of generations of UNH students makes it a symbol of hope in the endure of student self-government for campuses across the country.